I have written about 66 heroes of mine in the House of Representatives that voted “no” on your debt ceiling increase request in 2011. I believe we must have representatives that will vote to restore our freedom and that means voting to cut spending and lower taxes like the Patriots of long ago wanted. Today the Tea Party represented my views the most closely. Lord knows I have written a lot about that in the past. . I have praised over and over and over the 66 House Republicans that voted no on that before. If they did not raise the debt ceiling then we would have a balanced budget instantly. I agree that the Tea Party has made a difference and I have personally posted 49 posts on my blog on different Tea Party heroes of mine. I have written hundreds of letters and emails to you and I must say that I have been impressed that you have had the White House staff answer so many of my letters. The White House answered concerning Social Security (two times), Green Technologies, welfare, small businesses, Obamacare (twice), federal overspending, expanding unemployment benefits to 99 weeks, gun control, national debt, abortion, jumpstarting the economy, and various other issues. However, your policies have not changed, and by the way the White House after answering over 50 of my letters before November of 2012 has not answered one since. You are committed to cutting nothing from the budget that I can tell. THIS BRINGS ME TO ONE OF MY BIGGEST ECONOMIC HEROES AND IT IS THE LATE MILTON FRIEDMAN. Friedman had such revolutionary policies such as eliminating welfare and instituting the negative income tax and putting in school vouchers. The problem in Washington is not lack of revenue but our lack of spending restraint. This video below makes that point. I have written about the tremendous increase in the food stamp program the last 9 years before and that means that both President Obama and Bush were guilty of not trying to slow down it’s growth. Furthermore, Republicans have been some of the biggest supporters of the food stamp program. Milton Friedman had a good solution to help end the welfare state and wish more people would pay attention to it. Growing government also encourages waste and hurt growth but more importantly it causes people to become dependent on the government as this article and cartoon below show. My great fear is that the “social capital” of self reliance in America will slowly disappear and that the United States will turn into a European-style welfare state. That’s the message in the famous “riding in the wagon” cartoons that went viral and became the most-viewed post on this blog. Well, this Glenn McCoy cartoon has a similar theme. 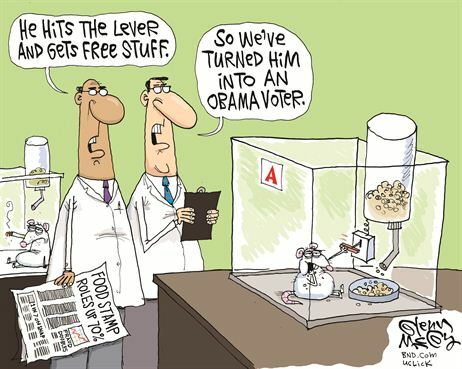 The only thing I would change is that the rat would become a “pro-government voter” or “left-wing voter” instead of an “Obama voter.” Just like I wasn’t satisfied with an otherwise very good Chuck Asay cartoon showing the struggle between producers and moochers. That’s for two reasons. First, I’m not partisan. My goal is to spread a message of liberty, not encourage people to vote for or against any candidate. Second, I’ve been very critical of Obama, but I was also very critical of Bush. Indeed, Bush was a bigger spender than Obama! And Clinton was quite good, so party labels often don’t matter. But I’m getting wonky. Enjoy the cartoon and feel free to share it widely. Why are despicable people sometimes subsidized by taxpayers? « High-tax states are languishing but zero-income-tax states such as Texas are growing rapidly!!! !